...to a lot of people, because they're not, as a rule, the largest, most powerful, and most dignified sects and denominations. And very often, my friends, these things are done in a wrong manner that only heaps ridicule upon them. But actually you know, when we look back into the life and the experience of Jesus Christ, to see what He did, to see the example that He set, to see the things that He did say, to see what He taught and how He commissioned His disciples, and when we look into the early Church, to see just what the apostles, and the elders, and the leaders — in the true Church, as it was led by the Spirit of God — did do in those early years of the true Church, we do receive some surprises. Now, if you've never noticed it, you'll really be surprised to see what a large portion of the time of Jesus' ministry — and He was setting the example for ministers — and what a large portion of His time was spent in healing the sick. You know God made us physical. He made man of the dust of the ground. And He put us here for a purpose. And during this lifetime, God is concerned about our life and our lifetime. And the whole purpose of our lives would be frustrated, if God had no concern about our physical welfare, and about our life while we are physical beings. He made us so that we can be transformed, that we can be changed, we can be converted from human to divine. From the animal kingdom into the very Kingdom of God, that we can be born again, born of God. But we're still of the animal kingdom, at least that's the way we've classified man and regarded it. And I think someday we're going to see that we should actually be classified as a separate human kingdom, and differentiate between the human family and the rest of the animal kingdom. Nevertheless, I think that scientifically, that's the way it's generally classified. And God is concerned about us in this material condition, and this material state, and about our material welfare as well as our spiritual welfare. And then this woman that had been going to the doctors for twelve years, had spent all she had on the physicians. She wasn't any better, she had rather grown worse. And they took all the money that she had, and now she was completely broke. But she said if she could only get to Jesus, He could heal her. Well, it was impossible to get to Him, to even get up to where she could even touch Him because of the crowd. There was such a great throng around Him. So she said if she could only touch the hem of His garment, she could be healed. Well, she did. And I devoted a good deal of the time in the preceding broadcast to that. Now the point I wanted to stress, and I want to repeat it again today is that He said, "thy faith — your faith has made you whole." He didn't say, "Daughter you're whole because I am Christ, because I am God incarnate in human flesh, because I have such great faith." He said, "Daughter, you had the faith to make you whole. Your faith has made you whole." And I want you to notice, my friends, that God requires you to have faith. Now, people will come to me and they say, "Well, I just don't have the faith. I don't have the faith." But they'll say, "Brother Armstrong, I know you have lots of faith, now, you get me healed." Well, I suppose this woman could have come to Jesus and said the same thing. Now, I represent Jesus Christ. I'm His minister. Jesus Himself has gone to heaven. But He has sent His Spirit and He has called others to speak in His name. And that means by His authority, that means they stand as His representative, sort of as a proxy representing Him. And He works in and through His own representatives. And so, He set the example. Now, this woman could have come and said, "I know you're the Christ, the Messiah. Now, I lack the faith, I just don't have the faith. I would like to be healed, if I had the faith. But I know you have the faith. Now, you ask God to heal me" Because actually Jesus Himself didn't do it, of, or in Himself. Any more than I can heal anyone myself, which I can't do. In other words, God Almighty, the Father and it was the power of God. But Jesus had the Spirit of God dwelling in Him, and that was the power. Not Jesus, not anything that was human, but the power of God and that was what did the healing. Now, Jesus still had to get that power from God. And so the woman could have come and said, "I don't have the faith to be healed. And I wish I had the faith, and if I only had the faith, I could be healed, but Jesus Christ I know you have the faith, now you heal me." I want to tell you, and I'm going to show you if we can get to it in today's program. I'm going to show you, that you can't get healed that way, and that Jesus would have turned her down if she had come like that. He turned to her and said; "...Daughter...thy faith hath made thee whole... (Luke 8:48) She had to have the faith to be healed! Now they came, and said she is dead, she has died. So don't trouble Jesus to come and heal her, she's died, it was too late. While He turned around to speak to this woman, why, she died. And they probably wanted to criticize Jesus because He had lingered along the way and hadn't hurried. And they said why trouble Him any more, your daughter is dead. Now, here He didn't say "I'm going to do the believing", He said, "You believe — only believe." You know, God is working out a purpose here below in you and me. And He wants you and me to believe, He wants us to have the faith. Of course God has it, of course, Christ has it, of course God has the power. But He wants us to learn these lessons. He wants us to receive these things and to exercise these things for our learning, for our good, for our development and our strengthening. Now, He told this man to believe, this ruler of the synagogue. And you know, by the way, now, in the religion of Judaism which is a religion that began really from Ezra and Nehemiah. It wasn't the religion of Moses at all, it was a degeneration, a deterioration, of the original religion that the Israelites had received from Moses. And it was a mixture of what they had received from Moses, mixing in with it a lot of pagan doctrines, that the Jews got especially up in Babylon. And that, they had acquired up there, and that they got from other pagans around them. And so they came to this mixture between what they had received out of the Bible and paganism and that was Judaism. Now, my friends, most of you don't know it, but what is called Christianity today is about the same mixture. It's a mixture of what you find in the New Testament and paganism. And leaving out a great deal of the Old Testament, that was in the true Christianity of Jesus, and was in the true Christianity of the early Church as it started out. And I'm speaking too of those churches called the gentile churches raised up by the apostle Paul. We have gotten so far away from the kind of Christianity they had, from the belief that they had, the doctrines that they upheld and proclaimed, the practices and the customs that they observed. And we have gotten into other things today, and so far removed from what they had, that really you wouldn't recognize the original Christianity if you saw it today. You would sneer at it — you would call it something else. Now, how did it happen? God never ordained it. People have gotten that far away from God, as they've gotten away from His Gospel, and as they have gotten away from His truth. And from the customs that He gave us into customs of the pagans. He took these men that were His disciples. He took with Him only believers. He wouldn't let unbelievers and those who doubted come along. I want you get that point, now, notice it carefully. And if you have a Bible, open it and read along with me. I'm in Mark, now, the fifth chapter and the thirty-eighth verse, now, Mark 5:38. Now, you would have thought that weeping and wailing would have touched Jesus' heart, and that He would have begun to shed some tears too just because they were. That's the way people would do today. And most religion today is nothing but a matter of sentiment and emotion. And here were people emotionally unstrung because someone had died. Now, Jesus didn't start to weep and wail with them. I want you to notice what He did. Jesus wasn't ever touched by a lot of, oh, maudlin sentimentality, and a lot of emotion that had no purpose. Now, He had real genuine compassion. He had real mercy and compassion, and real love. But He didn't have this cheap imitation that we see so much of today. I want you to notice. What did He do? He put them out of the house. They weren't sincere, they weren't believers. They were doubters, they were scoffers, and scorners, and they could weep like the pagans one time and sneer and scoff the next second. They were hypocrites. Now, why? Because Jesus Himself could not perform miracles where there was unbelief and where there were hypocrites. Now, you go into these church meetings where they try to think they're following Jesus' example today. And where they make healing a big part of the ministry. Now, I don't criticize them for making healing a big part of the ministry. Jesus Christ did that, and so did the early Church — that part of it is right. But there is something to be said about the manner and the method of their doing and how they do it. And I want to tell you that Jesus Christ never put on a healing show. He didn't do it for a show and a circus. 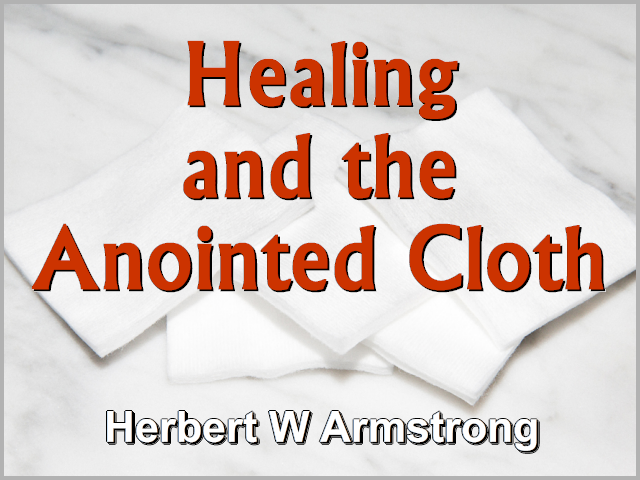 He didn't advertise a healing meeting and say, "Bring all your cripples, and your people on crutches, and the people in wheelchairs, and bring 'em down to me and I'll heal 'em." He didn't say to this man, 'I'll have a healing service next Thursday night. Bring your daughter.' He went to his house. And He put the doubters and the scoffers out. What do they do today? They have a meeting where there are all kinds of hypocrites, and doubters and scoffers. In any great public meeting of hundreds, or even thousands of people, you can't prevent a few scoffers and doubters from coming in. And so they have a healing show and make a circus of it and say, "Bring 'em." And they bring people, and they throw away their crutches, and call out, 'Glory, Hallelujah!' And they pronounce them healed, and they take them off. Now, there was such a healing show down in Los Angeles, and of course we here in Pasadena are a neighboring city to Los Angeles, and very close. It's only about fifteen minutes away down the freeway that we have, now. And two of our young minister students had gone down to this healing show, and to see what was put on. And the one that they made over the greatest, and was supposed to been proclaimed healed, and it was such a great show, making a spectacle and a show of it. And some thousands of people there, our two young men had to help out. And they questioned her very thoroughly to see whether she was really healed and she was not in any manner, shape or form healed, the whole thing was plain fake. And I tell you that kind of thing makes people lose faith in Jesus Christ, and in the fact that God does heal the sick today just as much as He ever healed the sick. Because it's carnal and he claims to put on a healing show. I tell you that's a plain fake, out and out! But listen, they say that, 'imitation is the sincerest flattery' and 'where there is a counterfeit there must be a genuine'. And that is true. And, my friends; "Jesus Christ [is] the same yesterday...to day and for ever. (Hebrews 13:8) And just as Jesus Christ healed then, He will heal today. He has not changed, it's only the people. But there are terms and conditions. And again, we find, it is to those that obey Him, it is only those that obey Him, that to them God gives His Holy Spirit. And it is only those who are obeying God, and doing those things that are pleasing in His sight, that receive the answer. Now, God requires that of you. That's why some people are healed today and some are not. Now, this father believed, and the mother and His disciples, and Jesus did — there were only believers there. Now, that's another thing. If you go into a public service where there are a lot of doubters and scoffers, that come to look on, and to scoff and to hoot and to howl, and to see whether there's anything to it or not. I tell you, my friends, Jesus couldn't heal anyone under those conditions. And if Jesus Christ couldn't do it, how can people today that claim to be His ministers? That is not the way healing is done, and it never has been done like that. Now, He didn't turn around and heal those blind men right away. I want you to notice, He didn't do it right away. He went right on into the house. They yelled outside, "Have mercy on us, thou son of David." He didn't pay any attention. Not according to my faith He said, but according to your faith. My friends, the apostle Paul healed many that were sick. As far as he was able he went to the sick. But his ministry became so enlarged and his time was so occupied and he became so busy he couldn't go to the sick people. And so finally he simply laid his hands on pieces of cloth, and he anointed them by proxy, and had those pieces of cloth sent to the people because he wasn't able to go, and that went in his stead. And when they were laid on the people, the people were healed. You'll find that in the nineteenth chapter of Acts. Now, in this ministry, I've had to do a great deal of that until sometimes it goes into the hundreds a week. And people from all over the United States, and even many parts of the world write in. Sometimes they call by long distance telephone, sometimes by telegraph, when someone is sick. And do you know that there have been some of the most miraculous healings — people of cancer, people of leukemia in hospitals, that were given up to die and have been healed. People of tuberculosis and many absolutely uncurable diseases. A man born blind from birth now sees. On the other hand, my friends, there are other hundreds who write in and who have the same prayer of faith from me and are not healed. Now, why? Can you begin to see? Jesus required their faith, and He said according to your faith be it unto you. And I am only acting as His agent, as His instrumentality, as His servant, and I ask Jesus and I ask God with the same faith for one that I do for another and yet some are healed and some are not. And so it went. They were just ordinary poor human beings. They couldn't obey Him even that far. They had said that before and we've noticed that in going along. They saw the miracles, they couldn't deny it, so they had to blame it onto the Devil and claim He was a minister of the Devil. And, you know, that's a good way to get into the unpardonable sin, and we need to be careful about it. And now finally, my friends, let me remind you, if you want to really understand your Bible, if you're willing to set yourself to devote a half hour or more every day to Bible study, you may enroll now for the 'Ambassador College Bible Correspondence Course.' We'll mail it to you. You can study it right in your own home. And we have decided to make no charge, no tuition, trusting God in faith. And so, this is Herbert W Armstrong saying, "Goodbye friends."